this sub is addicting. the turkey asian turkey meatballs are very light and extremely flavorful. please feel free to substitute with the meat of your choice, which in this case is usually pork. place the ground turkey, bread crumbs, garlic, ginger, scallions, hoisin, soy sauce and salt/pepper to taste in a bowl (i used a teaspoon of salt). combine very lightly with a fork. lightly form the mixture into 16 golf size meatballs. place in the refrigerator for 2-4 hours. place the meatballs on a aluminum foil lined baking sheet and bake in the oven for 30-35 minutes or until cooked through. 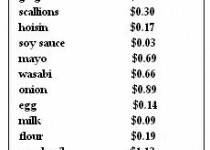 for the garlic wasabi mayo: combine all the ingredients in a bowl and place in the refrigerator until ready to use. heat the canola oil in a pan over high heat. while the oil is heating, prepare a breading station with two shallow bowls. place the flour in one bowl and mix together the egg and milk in the other bowl. toss onion slices in the flour. dust off the onion slices and place in the egg/milk mixture. toss well. remove the onions from the egg/milk mixture and add back to the flour. toss until coated. the onion strips may stick together at the point, which is okay. once oil is hot, add some of the strips to the pan using the tongs to break up and spread out the onion strips into the oil. fry until lightly golden in batches and remove from the oil. sprinkle with salt/pepper immediately after removing them from the oil. to assemble - spread the garlic wasabi mayo inside the hoagie roll. 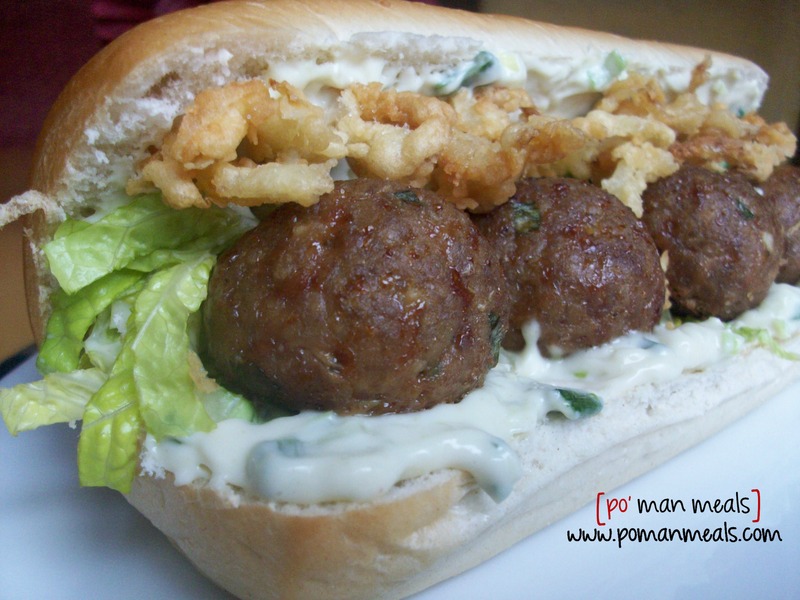 add some of the lettuce inside the roll, place four of the asian meatballs into the roll and top with fried onions.